There are three algebra fractions models: area, linear and set models. It is a model where you manipulate circles , rectangles or other shapes divided in equal parts. Obviously, you can also use cut-out shapes at home.The important things is to cut same shapes into many equal parts. By the way, cutting a circle in equal parts can be a first exercise already...Do you how to cut a circle in thirds using just a compass? This is a part-whole exercise. Take the the model 1/2 and 1/4 fractions. Take half of the circle. How many smaller 1/4 parts stay in half a circle? and in the whole circle? Now do the same for 1/3 and 1/6 fractions and 1/5 and 1/10 fractions. This model uses sets of objects formed by groups of subsets. It's more difficult to understand but it's worth the effort. 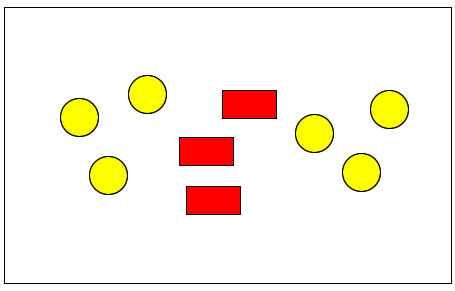 In the picture above are some base-10 blocks which can be used also for teaching algebra. It's not necessary to have them for learning fractions, though. You can have anything you already have at home, for instance a set 6 nuts and another set of 3 apples or just 6 circles and 3 rectangles. And have them grouped together to form fractions of 2/3 or 6/9.